Hello Friends, I hope this post finds you well and you are enjoying your day! I am hosting this week over at Just Us Girls. 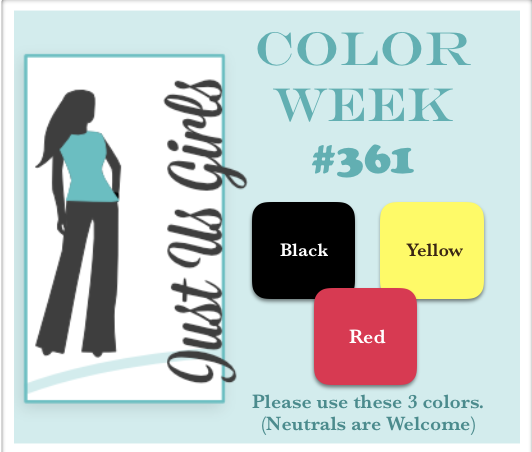 This week I have a Color challenge for you! The colors I have selected are Red, Yellow, and Black…neutrals are always welcome too. I love how easy and fun this card was to come together. It all started with my script background stamp from Stampabilities, followed by punching out many petals using my SU Blossoms Petal Punch. I then took a polka dotted wooden block stamp that I have had for eons and stamped the dots on my petals. The centers of the flowers were both made with some Nestabilities dies. I used some dimensionals for the centers of the flowers and I was done. The two sentiments are from Stampendous. 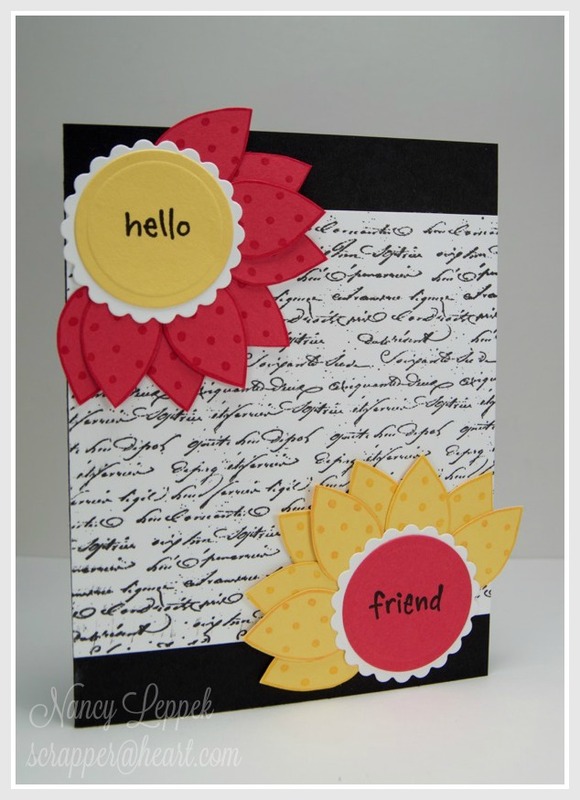 Categories: Cards | Tags: Blossoms Petal Punch, Card making, Cards, friendship, Hello, rubber stamps, Stamping Up | Permalink. A gorgeous card and a great color palette. Love that wordy background and how your pretty flowers frame the front of your card. Great color choice! Beautiful card my friend. Love the colors. Will try to get a card made this week’s challenge. Oh, I am lovin’ this!!! Wonderful background paper, and your design is fabulous. Really, really cute!!! Great challenge this week, my dear! Great color combo. Love the flowersand the background. This is adorable! The flowers are gorgeous, so big and bright, and I love the scripted background. Lovely choice of colors! I love those giant flowers, Nancy, and the script sets them off nicely. Great background. Love your take on the way you made your flowers so unique. Great colour choice Nancy. I love the bright colors that you chose for this challenge. This card is so stinking cute. The pop of the colorful flowers is great on the black and white background. These flowers are fantastic and I love that script background! Great job! How sweet is this!! what a delightful design Nanc’!! I can’t get over those flowers! highlighted just perfectly with your script!! Bravo! This is so pretty! I absolutely love those spotted petals on those darling flowers paired with the script background. Great shoice of colors for our challenge. Absolutely adorable card! Love it!